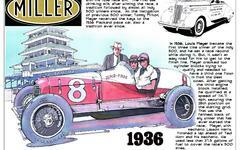 As I reflect on early auto racing history, I can't help but think about the history we create today. History just as far reaching, just as impactful as what shaped our world 100 to 115 years ago. Just for fun, here are two videos that juxtapose the automobile landscape yesterday and today. The first, which focuses on Henry Ford, offers interesting video of the man, his early cars and his legendary manufacturing process. The second is the intriguing Tesla roadster - a path forward or life on the bleeding edge?